Clear Health Analytics | Don’t worry about health insurers. They’re doing just fine under the ACA. Do you ever just want to say “quit yer bellyaching” to the insurance companies that complain about ACA drawbacks? After all, health insurers are doing much better than they’ve led you to believe. Open Enrollment for 2019 insurance coverage on the healthcare.gov marketplace opens nationwide November 1. There has been a lot of bellyaching from the insurance companies regarding the Affordable Care Act, their requirements to cover everyone – regardless of pre-existing conditions – and arguments over medical loss ratios and cost sharing reduction payments. But don’t shed too many tears for these health insurance companies. They’re doing just fine under the ACA, after all. IS THE ACA ACTUALLY BAD FOR HEALTH INSURERS – OR JUST THEIR PROFITS? Insurers use news affecting marketplace stability as an excuse to raise premiums – and their own profits. But as early as this summer, it became apparent that data from 2017 offered “evidence that insurers in the individual market are regaining popularity, even as political and policy uncertainty, repeal of the individual mandate penalty as part of tax reform legislation, and proposed regulations to expand loosely-regulated short-term insurance plans cloud expectations for the future,” writes the Kaiser Family Foundation. In fact, the profits seen by health insurers are better than the early years of the ACA. At the close of Q2, insurers reported surging profits, with an estimated individual profit of $155.60 per member per month, a “dramatic improvement from the comparative $21.40 they made in the same quarter in 2015,” writes Fierce Healthcare. And those 1.5% premium cuts touted in the 2019 marketplace? Considering that premiums rose by 40% last year, modest decreases this year don’t signal any generosity on the part of health insurers. “The low rates for 2019 reflect the excessive ones of 2018…we can predict 2020 prices on the exchanges will return to historic rate increases of 5% to 10% annually,” writes Forbes. Health insurers are growing marketplace profits from premium increases and the slow-growth rate of medical claims. 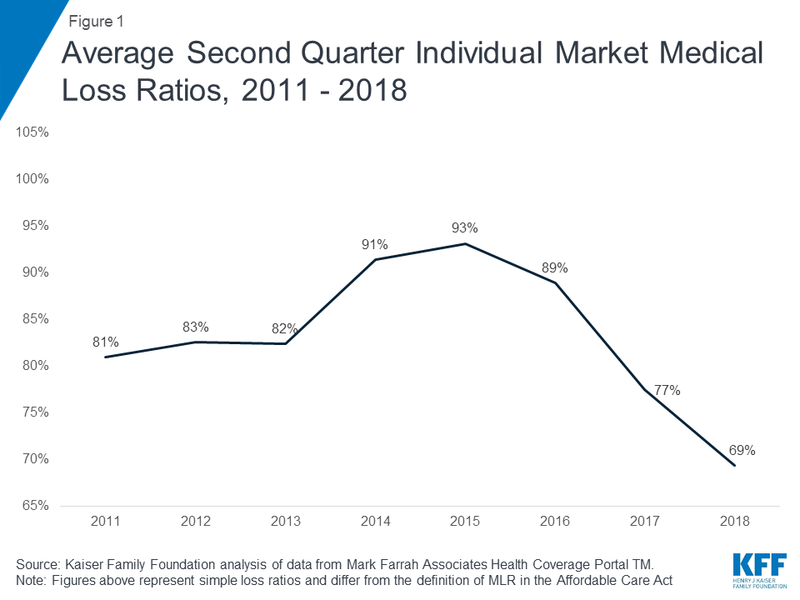 After a temporary spike, medical loss ratios have continued to decline in recent years, even dipping below pre-ACA rates. And even with the loss of cost-sharing subsidies, the market is expected to stabilize. Despite what they want you to believe, insurers who have opted out of the ACA marketplace aren’t doing so just because of profits. In fact, many are set to return to the market after such a profitable year. So why are they laboring on about losing money in the exchange? INSURERS TOUT INSTABILITY – BUT IS THAT JUST A MARKETING PLOY? Perceived ACA instability has allowed insurers to drop out of the marketplace – free of consequences – thereby reducing competition and raising rates further on consumers. “In 2018, just 36% of counties had at least three insurers, although those counties accounted for 60% of the population,” writes Fierce Healthcare. Low competition has been shown to lead to premiums that 50% higher than those in areas with competitive ACA marketplaces. But not all insurers have abandoned the health exchange, and for those opting in, opportunities abound. More than half of insurers are expected to return to the ACA marketplace this year, and some (like St. Louis-based Centene) are scaling large expansions. Increased enrollment and profits, along with repeal efforts on ACA legislation mean that many health insurance companies have ample opportunity to recoup any “lost” profits. The lack of marketplace competition has a drastic effect on premiums, and also shows a troubling correlation between monopolist marketplaces and high mortality rates. Recent research shows that carrier monopolies are the primary driver of premium costs in the ACA. “Researchers found that counties without at least three payers in the ACA exchanges were more likely to be in states where Republicans controlled the executive and legislative branches of government. They also tended to be rural and had higher mortality rates,” writes HealthcareDive. The political implications between low competition in markets and so-called “junk plans” flooding the marketplace doesn’t mean that all health insurers are out to screw their patients. 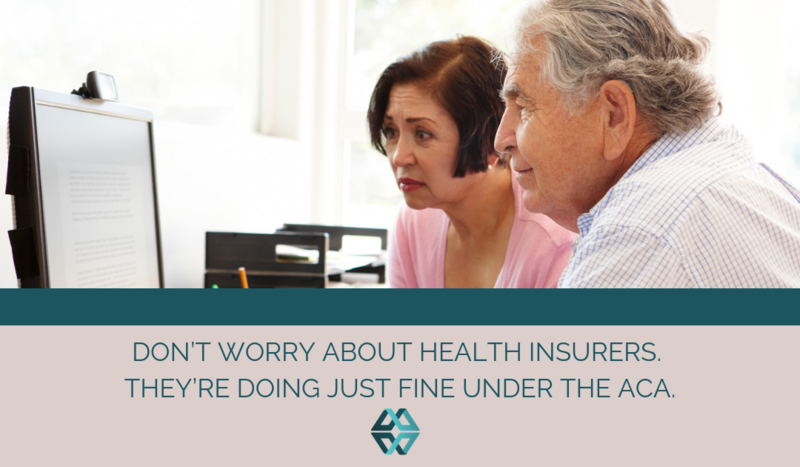 There are things that help insurers increase ACA enrollment and prove beneficial to patients. Insurers seeking to boost enrollment in the ACA health plan marketplace can (among other things) “help consumers navigate health plan purchases,” according to the Urban Institute. Offering navigation tools to consumers helps them pick the right plan, and the State of Washington saw ACA enrollment increase by 7.8% after state-backed guidance was issued. This included a plan finding tool. It’s time for health insurers to rely on price transparency rather than PR stunts to drive profits and provide greater quality of care for their patients.